We’re inundated with environment and climate-based information everywhere we turn these days, especially when it comes to buying food and beverage items from the supermarket. So what is an eco-conscious person supposed to do, when it comes to wading through the myriad ways in which we’re being marketed to as consumers? Call all green and sustainable messages really be true? And how can we take the daily habits we have, like drinking a cup of coffee or two, and turn those habits into environmentally conscious habits instead? Read on for a list of 5 easy ways anyone can buy their daily coffee while keeping the environment, the coffee, the coffee growers, and climate change in mind. It’s basically a fact that almost everyone who has ever tasted the beverage, ends up being addicted to coffee. The downside to this beverage is the cost of its production on the environment, and various people who produce and sell it. 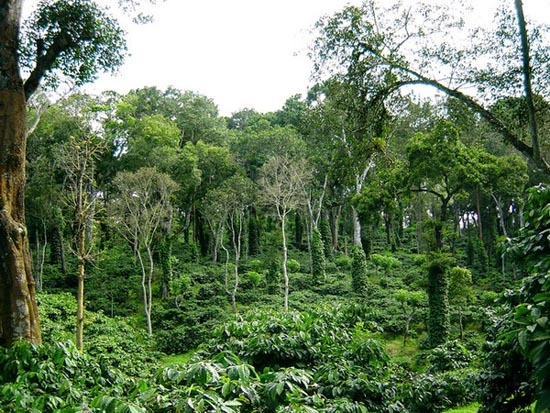 Here are five ways in which you can support eco-friendly coffee growing efforts. One of the first steps you can take to support environmentally friendly coffee growing efforts is to purchase only fair trade coffee, no matter where you source your morning Joe from. The “fair trade” label is to certify that the coffee growers have produced the coffee according to fair trade standards. The great thing about the label is that is also demands transparency and creates a dialog between the growers and the consumers. Look for the Rainforest Alliance Certified label, which strives to stave off deforestation. Also look for Fair Trade USA certified, which supports farmers in developing nations. Transporting coffee beans across the globe takes a toll on the environment. All of the planes, trucks, and assorted motor vehicles used to transport the coffee to your local cafe produce a hefty carbon footprint. The best way to remedy this situation is to look for coffee that is produced locally – if not in your state or region, then in a country close to yours. And if you’re going to source some of the wonderful flavors of coffee from around the world (which is many times inevitable), then make sure your local coffee shop is sourcing the beans in a fair, ethical manner. Normally, coffee is grown on large swaths of deforested land that once was a rainforest. Coffee that is grown in the shade however, is cultivated underneath the rainforest canopy, which has numerous benefits for both the coffee and the rainforest ecosystem. This practice conserves soil, water, and preserves natural wildlife habitats as well. One of the many benefits of drinking coffee that is organic and GMO free is that it is better for the environment. It is also grown in a way that produces less toxins and aftereffects on the local ecosystem. Most of the toxins that are produced through coffee production come about when coffee is produced in giant factories. By purchasing certified organic coffee beans and ascertaining that your coffee is free of GMOs, you are helping the environment. One great way to ensure that your coffee is as green as can be is to brew it yourself. If you are a two cups of coffee a day kind of person, those cups, filters, and cardboard sleeves really add up. Make your coffee at home, where you can use a mug and reuse the coffee filters. You can also recycle the coffee grounds, add them to your garden beds, or dispose of them in your compost bin! We hope these five tips will help you support environmentally friendly coffee growers. The benefits of going green can definitely extend to your daily coffee consumption as well.